The number of people in Somalia in need of emergency food aid is likely to rise to about 3.5m in the coming months, the United Nations has warned. Mr Bowden says that during the course of the next three months the number of people needing emergency food relief will climb by about one million from the current 2.5m. 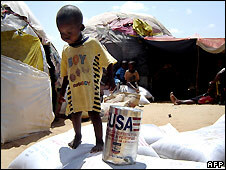 Aid agencies trying to get food into Somalia face extreme difficulties. The task is made more difficult because fighting and violence has displaced a million Somalis from their homes. Mark Bowden says Somalia has become one of the world's most challenging humanitarian crises. He fears that there is now a sense of fatalism about what is happening to the country.